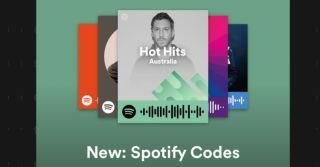 Spotify Codes feature allows you to scan and share music | What Hi-Fi? Spotify Codes are just like QR codes that you scan to share or discover new tunes, and they're available now in the iOS and Android app. Spotify has a new way of helping you share and discover tunes, called Spotify Codes. It's a neat system of QR-style codes that work within the Spotify iOS and Android app. To generate a Spotify Code, hit the '...' context menu while playing a song. Press 'Share', and the code appears under the album image at the top of your screen (it looks like an audio waveform). To share with a friend, they tap the camera icon next to the search bar in the Spotify app, and take a photo of your screen. The Coded song will start playing on their phone right away. Not only can this be used to share songs, albums and playlists with friends, it can also be used by artists and promoters themselves. Using the snap-to-scan method above, you can scan Codes from flyers, posters and billboards. Expect to see them spring up everywhere as musicians try to drum up sales of albums and concert tickets. You can also store the Code in your Camera Roll, so you can easily share it to the social network of your choice. That way, everyone will know what you're listening to. Codes are available now in the Spotify app for iOS and Android. MORE: Spotify Connect: What is it? How can you get it?